(CNS): The director of the Blue Iguana Recovery Programme says he is now confident that there are more than 500 of Cayman’s iconic indigenous reptile surviving in the country’s two reserves and in the wild. Fred Burton says the programme is only two years away from the target of 1000 blues set as a mark of its success. After more than a decade of hard work, and painstaking research, Burton and his team have succeeded in bringing the blues back from the brink of extinction which is an extraordinary achievement. Next month with the release of another young 100 blues into the new Colliers reserve there will be at least six hundred making it on their own. Burton explained that as the programme grows it gets more difficult to give an exact number as the blues are now breeding in the wild and it is no longer possible to count them. “As we get into these larger numbers the exact count becomes elusive because it isn’t possible just to go out there and find each and every one – nowhere near possible, in fact,” Burton told CNS. “We have to rely on sampling techniques now. But from the total released, we have deducted the ones we know have died, which are the ones which migrated out of the protected areas and were run over or killed by dogs. “As for the rest, we have no evidence of deaths, or morbidity/sickness/stress that would indicate we are losing any within the protected areas and surrounds, and we do have evidence of wild breeding which would counteract any natural mortality, so I’m fairly confident the numbers are if anything, conservative,” he added. Once the target of 1000 blue iguanas living in the reserves and the wild Burton said the whole focus of the programme will then shift from population restoration to sustainable management of the threats so that the incredible gains can be held in the long term. The positive news is even more incredible given the fact that there were no more than a dozen iguanas left in the wild when Burton began the programme around a decade ago. A 2002 survey demonstrated the dire circumstances which the almost forgotten creature was in. Despite knowing very little at the time about the behaviour, feeding habits, or lifecycle, Burton began the captive breeding programme and through rearing the iguanas and observing them at various ages, then letting them go and tracking their behaviour, the team learned the life of the blue iguana. The blues turned out to be big fruit lovers which may well have been the iguana’s downfall, as they fell prey to farmers’ dogs and cats, in the orchards where they went in search of their favourite food as their own natural habitat dwindled. As the team learned more aboutthe blues they were able to know when to release them to give them the best chance of survival. Now with two reserves that have no roads or farms the blues have been able to survive and breed. 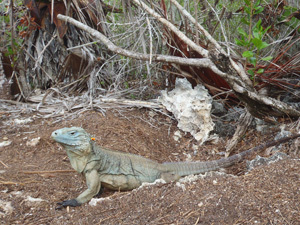 This summer Burton said the team found evidence of the blues nesting inside Colliers Wilderness reserve the iguana’s second colony alongside the Salina Reserve. Burton said that Juanita, an adult female released there last year became enamoured of the big male Zarco, and evidently they must have mated this summer. He said some of the younger iguanas may have also begun breeding and laying the odd egg there but he noted that Juanita (pictured right guarding her nest site) could easily have laid eight eggs or more. With the ongoing success of the recovery programme Burton is looking to the future, one which includes offering tourists access to these incredible and unique animals. 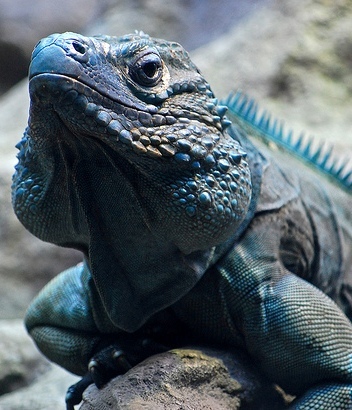 Plans are now afoot to build an ecologically self sustainable nature attraction at the new Colliers Wilderness Reserve where visitors will be able to see the blue iguanas once again making it on their own as nature intended. Will the Blues mates with the Greens? if so what will can be done to avoid this. The Blues are so majestic, Mr. Burton thank you for the tireless efforts in keeping them alive and well. LOL. You are a devil! In the process of saving these magnificent animals from almost certain extinction, Fred has created a conservation programme that has brought great respect to Cayman worldwide, and preserved hundreds of acres of Cayman's wild and rare landscapes in the process. It would be good to think that the same attitude to life around us could be adopted more generally. For example, scientists have now established that where healthy populations of Nassau Grouper exist in the protected areas of the Caribbean, populations of the invasive Lionfish are reduced by up to 90%. Cayman, sadly, has presided over the loss of 95% of its Grouper holes, but this evidence, combined with a touch of Fred's inspiration, might just provide the impetus for Caymanians to give their valuable Groupers complete protection until they recover their numbers. Well done Fred! Congratulations to Fred Burton. This is a fantastic achievement, and such good news. Yes, please can Mr Burton now focus his attention on the turtles? And thanks to BIRP Wardens present and past, most notably John, Alberto, Sam and Chris, and the International Reptile Conservation Foundation, and Durrell Wildlife Conservation Trust. And the Cayman Islands Department of Environment, plus several other government agencies, and of course, the National Trust for the Cayman Islands. And yes, volunteers and professional secondments from Cayman, USA, UK, Canada, Galapagos, Australia, Germany, and many countries more – and to the donors both private and corporate here in Cayman and elsewhere. There have been a great many of all these. There have indeed been many hands and hearts at work on this, and all deserve to share the credit. oh great…. more sh%t everywhere. at first, i thought it was the burglar, seeing the size of it… but there it was smiling at me, a big lump of black grass… maaaaaannnn…. upset! you just nasty… and to think you eat grass! When is the culling of the awful green Iguana going to start ? The Blue Iguana Recovery Programme was a success and will continue to be successful. It is amazing to know that these creatures will be a part of Cayman's heritage for a long time. Congrats ..no lets see if you can figure how to get rid of all the green ones and send them back to Honduras where they belong…Bloody pooping Pests!!! Congrats, to all involved job well done! Congrats Fred and everyone at the National Trust. Please now make itpossible to save other endangered local flora & fauna inluding the Cayman Parrot, Bald Pate Pigeon, West Indian Duck, Land Turtle ( hickatee) and mangroves/wetlands to name a few. Also a save young male Caymanians from extinction could be a good option.Ezzard and Arden will be pushing for this I'm sure with a Save a Caymanian Male campaign. With violent deaths, drug use and road fatalities occuring at a high rate maybe we should introduce this as a bill. Again great work with the Blue Iguanas and the Salina Reserve. Cayman should be extremely proud. And should support the BIRP with cash donations and volunteer time. This is fabulous news, nice to have a good story to read. Now we just need to get rid of the greens, any chance of them going on the menus restaurant owners? I still think there is mileage in my exporting green iguana skins to quality handbag and shoe manufacturers…..haven't seen anyone snap up that idea yet! Green is the official colour of the UDP. We cannot have a cull until there is some sure way of distinguishing between the poop-spreading, flora and fauna destroying iguana, and the average UDP supporter. Yes…it's true. Me and my bred'ren are back baby! Brilliant Mr Burton! Well done! It's good to see such efforts bearing fruit. I wonder if Mr Ezzard Miller will have anything to say about this massive success in his district since it has not come about by the efforts of a true born Caymanian who of course are the best workers in the world. I have heard Ezzard expound on Cayman Crosstalk about how the Blue Iguanas have been doing fine all along in the wild in North Side and that he dosen't know what all the fuss is about. you hear alot from ezzard that goes unquestioned on the 'talk' shows…. Maybe he could of let someone know so that we wouldn't all go around thinking they were endangered. Over development played a major role in the diminished blue iguana population and other local habitat. Was all this development done by hard working Caymanians? This is indeed good news. However, my concern is what will happen to the blues when they start to interbreed with the green iguanas (assuming they will interbreed). My understanding is that the greens have now migrated all the way past Frank Sound and it will only be a matter of time before we will see them in the Eastern and Northern districts in the same quantities we now see them in the West Bay/West Bay Beach area. Will they start to interbreed with the Blues and we start to see a new generation of Blue/Green iguanas? Is this possible? Is it time to start to irradicate the Greens? Perhaps Fred Burton could educate us on this matter. They are not within the same genus so inter-breeding is not possible. Sadly the failure to properly teach evolution in Cayman has also undermined our common understanding of the classification of species and what it means. Stop the insults at local education and the hidden insult to religion. I went to a local Christian school and had my share of science classes. And yes I understand cats and dogs don't make dogats or catogs. Gezzz! No, they are two seperate species and so should not interbreed. Fortunately the Green Iguanas and Grand Cayman's Blues are so different genetically speaking, that they aren't able to interbreed. "Blue" looking greens (blue heads are often seen) are just normal colour variations in the adult "green" (or Common Iguana). It is quite funny to watch on the rare occasions the two different species do come into contact with each other – they just don't seem to understand each other's body languauge! The Greens even seem to be confused between the sexes of the Blues – not exactly helpful to any attempt to breed, if that were even possible (it apparently isn't). So that, thankfully, is one thing we don't have to worry about. What to do about the invasive green population is a whole other question – and a matter of some complexity. Like the Lionfish on the reefs, I suspect eardication is beyond our reach, and some level of humane control is probably the best we can hope for. Please give an update, whats happening to the investigation of the blues in far off lands? The story of the Blues in Prague Zoo is moving slowly as international paperwork is involved to get blood samples to our geneticist for DNA analysis. So no new news yet, and it will be quite a while. When we eventually know, we will share the news! wow… dat lizard looks jus like the minister from the district of…. well…. rather it looks like a lizard… know you…. long tail, big mouth, almond eyes, some puffyness around deh neck…. SH%T… I"M IN TROUBLE NOW! thanks alot! … 1000 blue iguanas still can't fill the void that we are being outnumbered in our own country by expats! Without the expats you have no jobs and financial sector…end of story! …and without the expats you don’t have the blue iguanas either – Fred is and expat, and one that all Caymanians should be proud to have living in their country. In March of 2011 Premier McKeeva Bush announced that preliminary census statistics indicated a decline in overall population due primarily to a "diminishing work force". In July of 2011, the Caymanian Compass reported that in 2010, "the number of work permits declined significantly." So, it would seem that in 2009 the number of expat residents and workers was less than the number of Caymanian residents and workers. And in the last year, it would seem that the number of expat residents and workers has decreased. Therefore, I am not sure how you have determined how that expats outnumber Caymanians and suspect that the "void" exists only between your ears. Congratulations to Fred and his staff for a remarkable job! Well done!